Joseph George Cocker was born on 1 Aug 1877 in Evandale, Tasmania, died on 12 Nov 1945 in Launceston, Tasmania at age 68, and was buried on 14 Nov 1945 in the Carr Villa Monumental Cemetery, C7/172. Joseph married Mary Speers, daughter of Robert Speers and Elizabeth Handley on 21 Apr 1902 in Church of England, Gray, Tasmania. Mary was born on 3 May 1878, baptised at Christ Church, Cullenswood, on 4 Aug 1878 and died on 26 Mar 1918 at Gray, Tasmania at age 60. One year earlier Joseph's brother Frederick James Cocker married Mary's Aunt, Sarah Fanny Handley. The inquest touching the sudden death of Mrs. George Cocker, of Tower Hill, which took place at Mrs. Cameron's residence, Mangana, at 9.30 p.m. on Saturday, was held at the Alpine Hotel this morning, before the coroner (Mr. Owen Holder) of Fingal. Sergt. Beresford watched the proceedings on behalf of the police. Evidence was given by Mr. Cocker, the husband, Mesdames Cameron and Cole, and Dr. Harris, of St. Marys. The doctor, who held a post mortem examination yesterday, deposed that death was due to hemorrhage, following confinement. The coroner returned a verdict in accordance with the medical testimony. The deceased leaves a husband and six children, the eldest being fifteen. The little baby is well. The body will be conveyed to St. Marys for burial tomorrow. The sympathy of all, is expressed with the bereaved family, who are so well known and respected here. COCKER.-On November 12, 1945, at the General Hospital, Launceston, Joseph George, loved husband of the late Mary Cocker, late of Legerwood and 11 Bald Hill, Trevallyn, and loving father of Violet (Mrs. Doherty), Muriel (Mrs. Torrens), Daisy (Mrs. Haas), Madge (Mrs. Thompson). Phyllis (Mrs. Howlett) and Joseph; in his 69th year. COCKER-In loving memory of my dear father, Joseph George, who passed away on November 12, 1945. Your memory is a keepsake With which we will never part; God has you in His keeping, Dad; We have you in our hearts -Inserted by his loving daughter and son-in-law, V. M. and J. T. Doherty, Ringarooma. 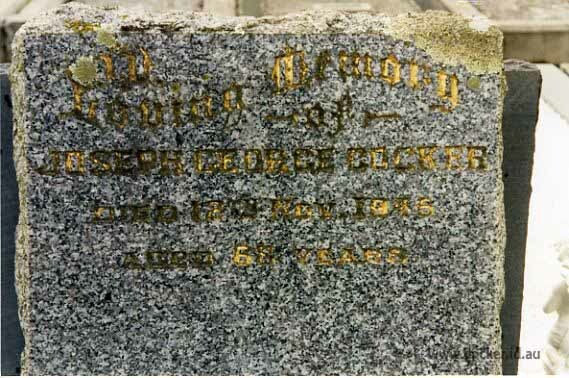 COCKER-Sweet and loving memories of my darling granddad, Joseph George, who departed this life at Launceston, November 12, 1945. Sweet are the memories that never fade of my granddad I loved, but could not save; To those who knew him all will know What a sad loss I had two years ago. Dear God, please take this message To my granddad up above, Tell him how I miss him And give him all my love. My Granddad. --Inserted by his loving eldest granddaughter, Daureene M. Doherty, Launceston. COCKER-In loving memory of our dear father, who passed away on November 12, 1945. Always remembered. -Inserted by his loving daughter Daisy, Ringarooma. COCKER-In loving memory of my dear father, who passed away November 12, 1945. Always remembered. -Inserted by his loving daughter Madge, Laurie, and family, Legerwood. COCKER-In loving memory of my father George, who passed away on November 12, 1945. We think of you in silence With hearts that are sincere, And cherish all the memories Of days when you were here. -Inserted by his loving daughter Muriel, son-in-law Charlie, and grandchildren. COCKER-In loving memory of my dear Uncle George, who passed away on November 12, 1945. With tears I watched you sinking, I watched you fade away, And tended you with loving care, But could not make you stay. I watched beside your bedside As the lonely hours passed; My heart was crushed and broken When I saw you breathe your last ---Inserted by his loving niece, Ethel Curtis, Launceston. 4-Violet Amelia Cocker was born on 31 Oct 1902 in Queen Victoria Maternity Hospital, Launceston. Violet married James Thomas Doherty, son of John Doherty and Florence Elizabeth Smith, on 6 Jul 1922 in RC Deanery, Launceston. James was born on 4 Apr 1892. They had one daughter: Doreen. 5-Doreen Doherty. Doreen married William Braad Moore. 4-Harold Joseph George Cocker was born on 3 May 1904 in Queen Victoria Maternity Hospital, Launceston, died in Jun 1967 in Coleman Street, Hobart, Tasmania at age 63, and was buried on 14 Jun 1967 in Cornelian Bay, Roman Catholic, CP53. 4-Muriel Mary Cocker was born on 31 May 1906 in Tower Hill, Tasmania. Muriel married Charles John William Torrents, son of John Levi Torrents and Edith Maude Wells, on 9 Oct 1928 in Legerwood, Tasmania. Charles was born on 5 Mar 1908 in Evandale, Tasmania. A very pretty wedding was solemnised on Tuesday the 9th, in the Presbyterian Church, Legerwood, which had been decorated for the occasion with greenery and spring flowers by the friends of the bride. A large white wedding bell was suspended overhead the bridal party. The contracting parties were Charles, eldest son of Mr. and Mrs. J. Torrents, of the railway staff, and Muriel, second daughter of Mr. Geo. Cocker, of Legerwood homestead. The bride looked, very pretty and dainty as she entered the church, leaning on her father's arm, who afterwards gave her away. The bridal frock of white crepe de chene with overdress of silver lace, with long sleeves and rounded neck was very sweet. The veil and orange blossom, worn capette fashion, completed the costume. These were loaned by Mrs. D. Reeves who also presented the satin cushion for the bride to kneel on. The bride carried a beautiful bouquet of white stocks, azalias and erica, with asparagus fern and streamers. Miss Curtis as bridesmaid wore a pretty apricot crepe de chene frock, with white hat and carried a pretty bouquet of pale pink azalias, etc. The little niece of the bride acted as cushion bearer. and was prettily dressed in apricot silk with pink. Mr J. Torrents supported his brother as best man. Quite a number of people were present to view the ceremony. Rev. Reynolds performed the marriage ceremony, and Mrs. Saville presided at the organ. After the signing of the register the wedding party were motored to the bride's father's, where the wedding lunch was held, and the usual toasts honored. The bride travelled in a brown one-piece costume trimmed with silk braid, and hat to correspond. They had three children: Max, Muriel Joyce and Dorothy. 5-Max Torrents. Max married Mary Easterbrook on an unknown date. They had four children: Cynthia, Shirley, Vicki and Allen. 6-Cynthia Torrents. Cynthia married Lance McKercher on an unknown date. They had five children: Kim, Mathew, Peter, Ancola and Janita. 6-Shirley Torrents. Shirley married John Barrett on an unknown date. They had four children: Richard, Jonette, Lynette and Bridget. 6-Vicki Torrents. Vicki married Tom Johnson on an unknown date. They had one son: Nicholas. 5-Muriel Joyce Torrents was born on 23 Jun 1932. Muriel married Keith Raymond Fry on 17 Apr 1950. Keith was born on 22 Jun 1928. They had three children: Bryan Keith Charles, Lois Mary and Deborah Joy (Debbie). 6-Bryan Keith Charles Fry was born on 18 May 1952 and died on 21 Dec 1996 in Wellington, New Zealand at age 44. Bryan married Diane Roberts on an unknown date. 6-Lois Mary Fry was born on 26 Feb 1951. Lois married John William Porter on 29 Dec 1975. John was born on 25 Dec 1949. They had three children: Adam, Daniel and Lauren. 7-Adam Porter. Adam married Hollie Green. They had one son: Seb. 8-Seb Porter-Green was born in 2001. 7-Lauren Porter. Lauren married Rodney Pickard. They had two children: Lachlan Lawrence and Victoria Louise. 8-Lachlan Lawrence Pickard was born in 2001. 8-Victoria Louise Pickard was born in 2003. 6-Deborah Joy (Debbie) Fry was born in 1952. Deborah married David Gehan on an unknown date. They had three children: Donna, Kimberley and Benjamin Frances. 7-Donna Gehan. Donna married Andrew Delley. They had three children: Connor, William and Charlotte. 7-Benjamin Frances Gehan was born in 1988. Muriel next married David Nicols on an unknown date. 5-Dorothy Torrents. Dorothy married Jim Crawford on an unknown date. They had two children: Paul and Shannon. 6-Paul Crawford. Paul married Yvette Senior, daughter of Graham Senior and Sylvia, on 19 May 1985. They had two children: Kristy and Jake. 4-Daisy Elizabeth Fanny Cocker was born on 19 Dec 1907 in Tower Hill, Tasmania. Daisy married Walter John Haas on 4 Jul 1928 in Scottsdale. They had four children: Alan, Ron, Walter and Dorothy. 5-Walter Hayes. Walter married Helen Bird. They had three children: Susanne, Louise and Sharon. 4-Florence Madge Cocker was born on 19 May 1910 in Tower Hill, Tasmania. Florence married Lawrence William Thompson on 4 Jul 1928 in Scottsdale. Another name for Lawrence is Laurie. They had five children: Marjorie, Kathleen, Betty, Ruth and Ronald Lawrence. 5-Marjorie Thompson. Marjorie married Neil Berwick. They had four children: Peter, Anthony, Susan and Ruth. 6-Peter Berwick. Peter married Jennifer Tonks. They had four children: Angela, Simon, Jamie and Elizabeth. 6-Anthony Berwick. Anthony married Julie Dolly. They had two children: Paul and Sally. 5-Kathleen Thompson. Kathleen married Colin Davis. They had three children: Cassandra, Thomas and Pamela. 6-Cassandra Davis. Cassandra married M. Wright. They had four children: Daniel, Emma, Damian and Joseph. Cassandra next married M. Hoban. 6-Thomas Davis. Thomas married Kath Robinson. They had one son: Brett. 6-Pamela Davis. Pamela married D. Handley. They had three children: Lindy, William and Sophie. 5-Betty Thompson. Betty married Howard Barr. They had three children: Diane, Michael and Margot. 6-Diane Barr. Diane married Kasprzak. They had two children: Anita and Kia. 6-Michael Barr. Michael married G. Richardson. 6-Margot Barr. Margot married Doug Storer. They had three children: Ben, Sam and Meg. 5-Ronald Lawrence Thompson was born on 23 Mar 1934. Ronald married Ruth Margaret McHugh, daughter of Andrew John McHugh and Winifred Alice Riley, on 24 Mar 1956. Ruth was born on 29 Apr 1934. They had four children: Joy Alane, Maree Alice, Anthony Lawrence and Andrew John. 6-Joy Alane Thompson was born on 18 Dec 1956. Joy married Russell Brown on 19 Sep 1987. Russell was born on 23 Feb 1948. They had two children: Aaron Douglas and Kent Andrew. 7-Aaron Douglas Brown was born on 4 Jan 1989. 7-Kent Andrew Brown was born on 2 Aug 1990. 6-Maree Alice Thompson was born on 21 Feb 1958 and died on 14 May 1978 at age 20. 6-Anthony Lawrence Thompson was born on 3 Aug 1959. Anthony married Tania Leanne Krushka on 8 Mar 1987. Tania was born on 19 Apr 1965. They had two children: Alison Maree and Wade Anthony. 7-Wade Anthony Thompson was born on 22 Aug 1991. 6-Andrew John Thompson was born on 3 Aug 1961. Andrew married Kim Maree Crowden, daughter of William Charles Crowden and Unknown, on 2 Apr 1983. Kim was born on 1 Dec 1961. They had two children: Dayne Andrew and Keisha Kathleen. 7-Dayne Andrew Thompson was born on 23 Jul 1984. Dayne married someone. He had two children: Shontai-Lee Amy and Alicia Maree. 8-Shontai-Lee Amy Thompson was born on 26 Jul 2004. 8-Alicia Maree Thompson was born on 8 Oct 2008. 7-Keisha Kathleen Thompson was born on 2 Apr 1987. 4-Phyllis May Cocker was born on 23 Mar 1918 in Mangana, Tasmania. Phyllis married Bert Howlett.